BBC NEWS | Technology | Can web predict economic gloom? Can web predict economic gloom? Gambling, guns and religion, possibly three words that you would not think of associating with an economic downturn. However, a new online prediction tool has just been launched by the University of California to see how the US economic recession has affected people's online behaviour. The 'Web of Misery' is an online forum which is part research project and part game - and is inviting people to predict how much traffic is likely to increase to internet sites devoted to subjects that are often associated with economic distress, such as religion, firearms, substance abuse and gambling. The project has been designed by Donna Hoffman, who is a co-director at the Sloan Centre for Internet Retailing in the US. "People have always been judging the likelihood of certain events in the online retailing space - how much will sales growth be on the online holiday season, to what will be the most popular online holiday shop and the most successful promotions. "As the economy started to get worse and worse, I started to think that it might be a fun idea to look at websites as a different kind of online indicator of economic distress. "So, by actually seeing which website's traffic was going up, might indicate things were actually getting worse," she said. She looked at various research from other disciplines which showed that in times of economic gloom, for example, people tend to gamble and drink more. 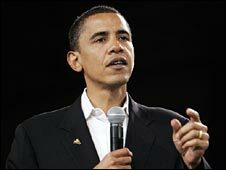 The Democratic presidential candidate Barack Obama has also said that in hard times people tend to turn to guns and religion. "There are about ten different areas where we could find websites that would target these kinds of ideas," said Ms Hoffman. There are ten categories in the project and each one has a website associated with it. Predictions are taken from many websites, which include, for example Biblegateway.com, which lets you read and search for scripture in just about any language in the world. They also use a site called Impactguns.com, which is one of the largest online retailers of guns and Foreclosure.com which tracks the number of repossessions that are for sale in the US. They track the growth of the websites in terms of the number of unique users that visit the various sites on a daily basis. They then calculate growth statistics from these figures and then ask people to forecast what they think the growth in traffic will be. There are cash prizes for people who forecast correctly. "We have a little over 450 members who are playing in the different games in the web of misery. "People are pretty bullish on bad economy, they are forecasting that these sites are going to grow significantly in terms of traffic over the next quarter and some sites are expected to grow even faster," said Ms Hoffman. She thinks that it would be a good idea to create an index from these ten different areas and relate them to more traditional economic indicators such as the Consumer Sentiment Indices that are published in New York Times or Wall Street Journal.